There are weapons that speak to you. To look at them is to hear their stories echo through time. To see yourself stalking your prey through the ruins of a place that humanity used to call home, you need only clutch the grip with your fingers. Closing Time was envisioned to be a weapon imbued with such stories. It wasn’t collected from a gun rack at the end of an assembly line. Someone loved it before they too were lost to the dust of our shattered civilization. “It was owned by a group of survivalists operating on the new frontier,” Tom Doyle tells us. 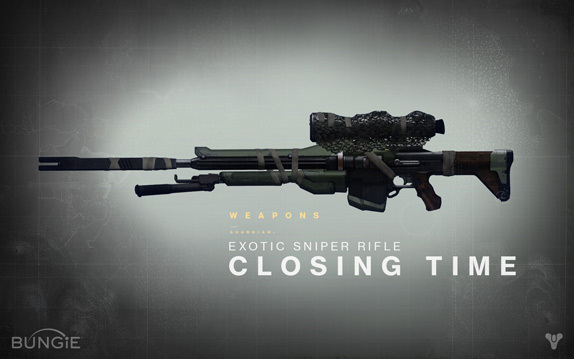 Like all Exotic weapons in Destiny, the Guardian who packs them on the mission will not be the original owner. These hunting tools are out there in the wild, waiting to be discovered and put back into service. The details in the design of this old long barrel allude to untold adventures – just like the ones you’ll experience when you inherit it. New ways to create weapons for the heroes of Destiny have given us new elements we can use to illustrate this world. According to Doyle, the fabrication of this weapon used everything in the upgraded palette. These are the nuances that will haunt your imagination between missions. What will be most important are those moments when this weapon is butted up against your shoulder. When the Cabal are in the crosshairs of Closing Time, and you’re about to put their lights out, the only story you’ll care about will be your own. Disclaimer: Destiny is a work in progress! This is just one weapon in an ongoing series in which we'll dig into the finer details of our upcoming first person action game, and explore how every element shapes the brave new world where your adventure will take place. All items, details, names, and pieces of random trivia are subject to change or eviction from the public house for poor behavior.